You are currently browsing the tag archive for the ‘Curry leaves’ tag. Cooking with Green Tomatoes and Chilies from my garden. 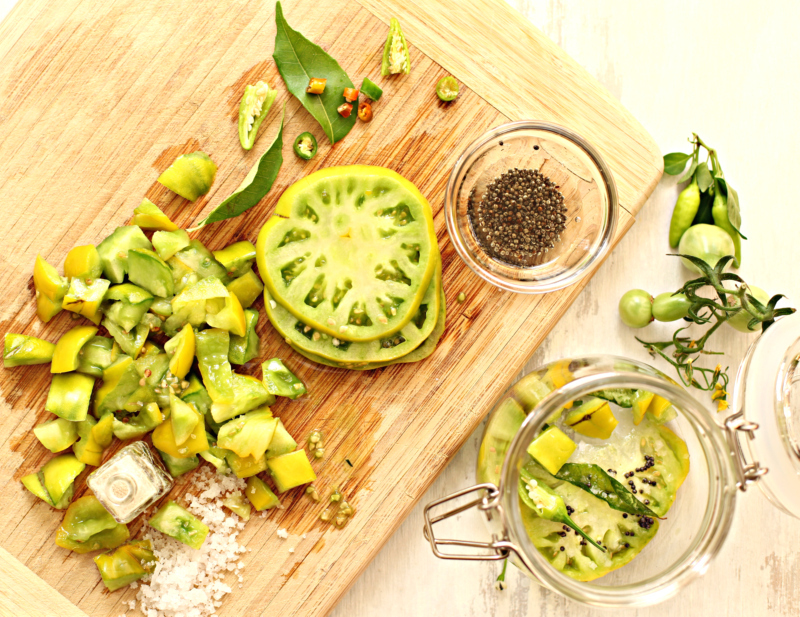 Today, my green tomatoes are the stars in my kitchen. I pulled out the last of my tomato plants and harvested all the tomatoes that have not had a chance to ripen. I look forward to this end of summer crop so I can make my favorite pickle from my childhood. It is simplicity itself. I hope this recipe is useful to all of you looking for new ways to use them. Agreed, a few of the ingredients might not be available in a non Indian home. I am sure you have some Indian friends who’ll be more than happy to lend them to you. Or else they are readily available at Indian stores. Warm the oil and drop the mustard seeds in it. Wait till they pop, turn the stove off. Add the green chilies, hing, curry leaves and salt. Twirl everything in the pan. Pour over the chopped tomatoes. Mix everything together. Let it rest for at least fifteen minutes to incorporate all the flavors. Must be refrigerated after half a day. Use within a couple of days. Serving suggestion, mix with rice. My Garden to Table Recipe-Cucumber in a coconut, mustard and yogurt sauce and how to remove bitterness from a cucumber. Cooking with cucumbers from my garden. Here are my last few posts about cooking from my garden for the year 2012. I pulled out my remaining cucumber plant a few days ago which still had a few cukes on the vine. I had left them on to mature on the plant so I could prepare this off the beaten path kind of a dish where the cukes are cooked in a coconut mustard sauce. I’ve noticed some of my home grown cucumbers have a bitter taste just like the ones that I used to eat in India. The department store cukes never seem to have that problem, maybe their growers know something the average home gardener does not know. Let me share a tip that is widely practiced in India, for eliminating the bitterness from a cucumber. 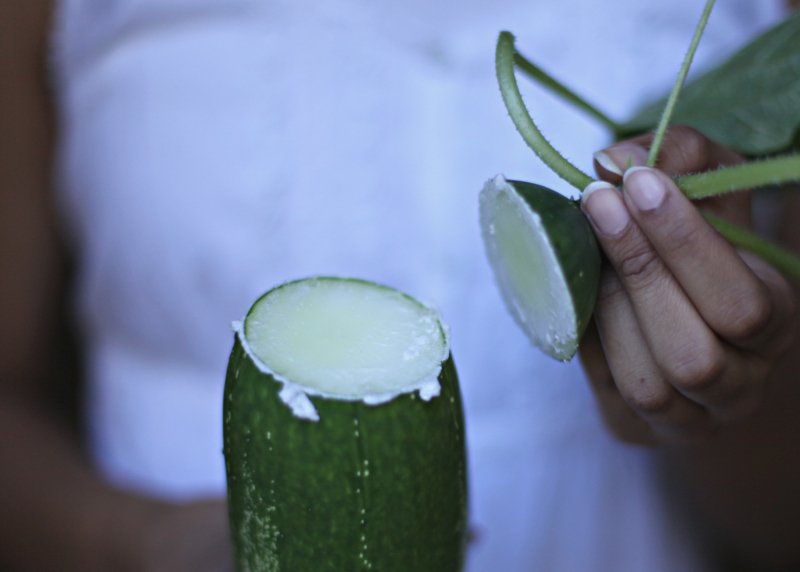 Cut the tip off a cucumber and rub both ends vigorously. A whitish foamy substance oozes out, continue rubbing till all of it comes out. Then cut at the other end and repeat. This way the bitterness causing compound called cucurbitacins are pulled out and you have a perfectly edible cuke. This may be sound like an old wives tale but I swear by it. The cucurbitacins apparently reside just under the skin and near the stem end, so if a slice of cucumber tastes bitter, peeling the cucumber deeply should also work. Soak the mustard in a tablespoon of warm water for about fifteen minutes. 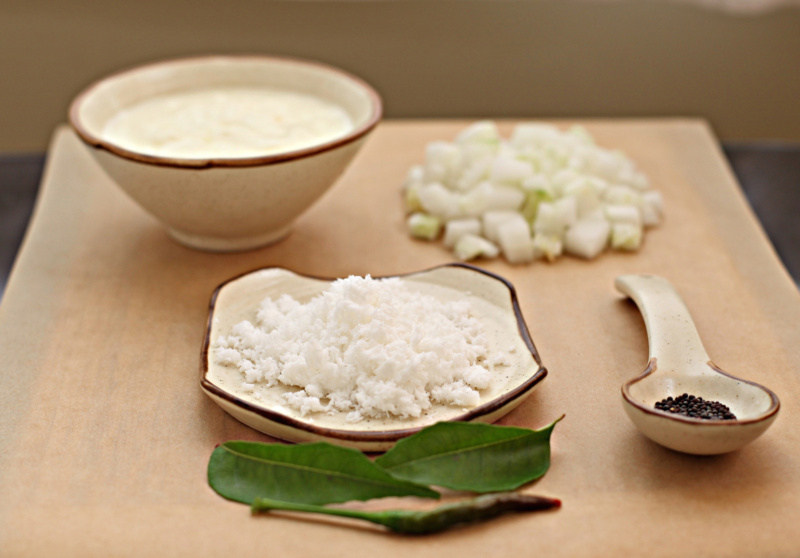 Then grind the mustard, coconut and chili in a cup of warm water to a smooth puree, making sure the mustard seeds don’t remain whole. 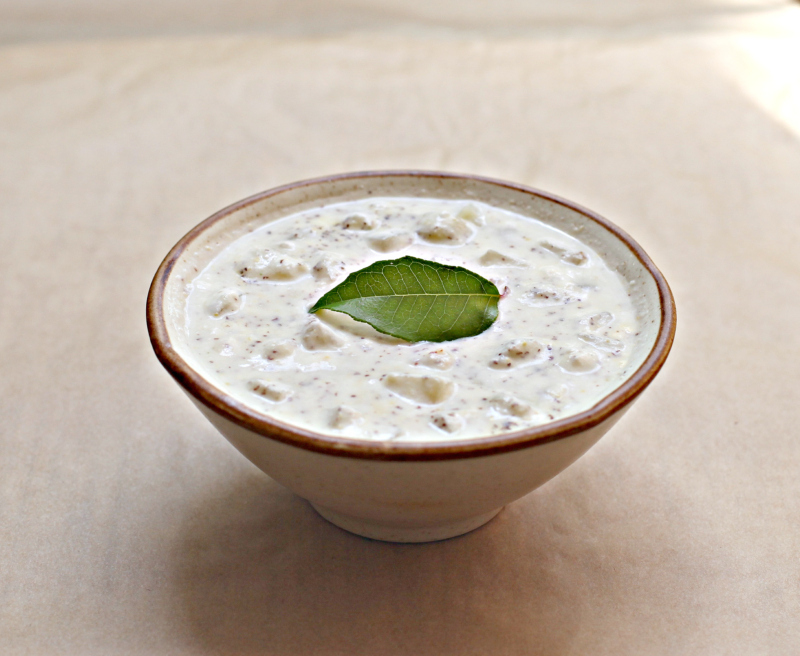 In a saucepan put the coconut mustard puree, the diced cucumbers and salt to taste. Cook till the sauce is bubbling for at least a couple of minutes. Cool and add to the yogurt. Granish with curry leaves. 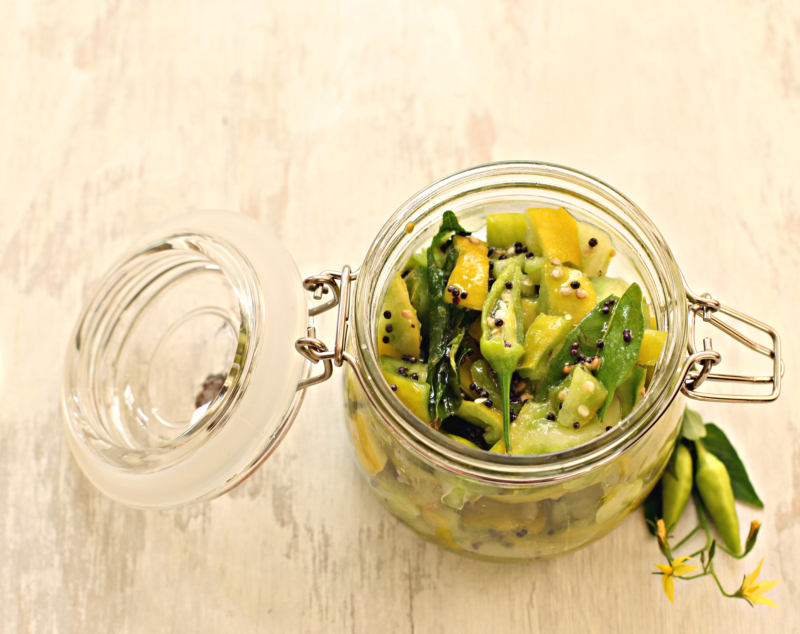 Serve with rice and a spicy dish or just plain Naan.